Mamabelly's Lunches With Love: Laptop Lunches Review & Giveaway! Laptop Lunches send us a Laptop Lunches Bento-Ware box to review and we immediately loved the versatility of the lunchbox! The lunchbox comes with two open containers and three water-tight containers with lid. It has a built-in compartment for utensils and a napkin. We packed a Greek salad with lettuce, shaved cucumbers, feta cheese, olives and grape tomatoes, a half a pear, a chicken sandwich on swirl bread, Greek salad dressing in the mini container and some more cucumbers. We packed Goldfish and Naturebox Cinnamon Almonds, grapes, a tangerine, applesauce and a pepperoni sandwich with spinach. Very similar to Tuesday's lunch. We packed popcorn and Naturebox Almonds, grapes and tangerine pieces, strawberry yogurt with mini chocolate chips and two chocolate spread Spider-Man sandwiches. And today we packed a liverwurst sandwich, kiwi, plain yogurt, mini chocolate chips for the yogurt, popcorn and a cereal bar. But the great people at customer service told me that there is an easy fix! Just heat up the warped container again with hot water and insert the other containers of similar size and let cool over night. It worked for us and was an easy fix! Overall, we really love our Laptop Lunches lunchbox and it is Mamabelly Kid Approved! Everyone from my first grader to my soon-to-be middle schooler loved the lunchbox! Want to win a Laptop Lunches lunchbox? Open to US Residents only! Winner will be notified via email and has 48h to respond before a new winner will be drawn. I actually do not have a laptop lunch box and would love to win one! I love how their menus include a lot of adult options. I myself would make the Fruit Salad bento from the summer menu! I also do not have a laptop lunch box. I would make the Angel Hair Pasta with Sauteed Vegetables from the Spring menu because it looks delicious! The joys of summer in a bento looks yummy. I'd pack that for sure! 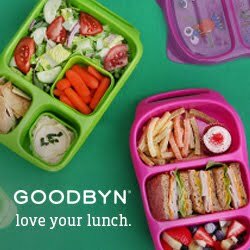 I don't have a laptop lunch box and would love to win one since I have been making bento's for my daughter for about a month now. I love the trick of heating it back up if it warps! I love the Breakfast for Lunch idea! A close second would be Refried Roll-ups! Yum! I would make the "a bento favorite" sushi roll bento - my 3yo and I have been experimenting with making sushi at home. I love the Breakfast for lunch idea! My second option is the Refried Roll-ups menu. Looks so delicious! I would love to win a laptop lunch box. Since I have been making bentos for my daughter for about a month now this would be perfect! Thanks for the chance to win! I'd make the sushi bento - my 3 yo and I have been experimenting with making sushi at home. If I won I would pack the Springtime Snacking bento because it not only looks yummy but is one of the few gluten free meals on your menus. Thank you the review and the giveaway of Laptop Lunches lunchbox. Oooooh, so many yummy choices. I'll be coming back to that site! I looked at Spring and loved Bento Fiesta and Cheese Tasting Bento Lunch! There are so many great recipes!! I would have to try the Spring-Has-Sprung Spring Roll and Somen Noodles because they are so different and they look so yummy! He is so picky... I don't know if any of these fancy menus would work for him. I would pack finger foods that I know he'll eat - apples, crackers, cheese, and maybe applesauce in the dip container! I'd do the pesto pasta lunch as my kids love pasta!!! I am always in need of healthier options for picky eaters and for my self to get back in shape after having my 4th child. I love the spring and summer menu ideas! It's a Wrap! would be a good option for me to lower my carb and calorie intake while watching cholesterol. I just had a heart attack, and I am enjoying trying out lots of new heart-healthy lunch and dinner ideas! I would pack bento snacks or a "back to basics bento" because those are things my sons (2 & 4 years old) would actually eat. The Angel Hair Pasta with Sauteed Vegetables looks delicious!!! It has sautéed chick peas, onions, swiss chard, kalamata olives and small yellow tomatoes which look like a great combination. I'm not a huge fan of pop corn; But it seems like a great combination with the cantaloupe. It seems more of an adult meal to me. The Early Spring Salad looks pretty fancy. The tuna salad and sliced kiwi caught my eye. And I like mixing my tuna salad with some veggies. Definitely a fave. I would pack pasta primavera for my daughter, she likes noodles and veggies (well, sometimes) and it would be something different them her normal lunches. The Early Spring Salad looks delicious. I love mixing my tuna salad with different veggies. And kiwi is one of my favorite fruits. I think it's super cute how there's a container for the salad dressing. Angel Hair Pasta with Sauteed Vegetables looks so good! Specially with the chick peas and sautéed onions, swiss chard, kalamata olives and small yellow tomatoes. What an awesome combo! A little fruit here and a snack there. Cheese if needed. Both meals are a fave. I would make some bento snacks and I liked the "cheese tasting" bento lunch :) Great Giveaway! I have one Laptop Lunchbox and would love another one. I looked and the Spring menus and like the Pesto Ravioli lunch. I would make Asian noodles for my daughter, since it's her favorite food. I would make Asian noodles for my daughter, since that is her favorite. I would pack the Pesto Ravioli lunch or the whole grain pancakes, because my one might actually finish his lunch. Looking through the menus provided a lot of fantastic ideas. I would pack the fiesta bento or bento snacks. I would make the Baby Spinach Salad bc it looks like a perfect summer lunch with the berries. My name is Nancy and i am addicted to bentoing. Laptop lunchbox will support my bento cravings. I would make the one with the 1/2 avocado - my girls love it. I'd add lunch meat and cheese and either cut pieces of bread or roll up strips for mini roll ups. yum! with cherry tomatoes and carrots too. Bento Fit for Your Favorite Tyke because I like packing them fun, and Baby Spinach Salad for me. Because I like spinach salad! I would male Angel Hair Pasta with Sauteed Vegetables! My son loves pasta, and this would be great as a school lunch! Love the Bento Menus...I'd go with the picnic menu because I'm a fan of finger foods! I love the Bento Menus! I'd try the picnic menu because I'm a fan of finger foods! I would love the Arugula Salad! Sounds delicious! I like the Double Salad Wrap because I'm trying to eat healthier and smaller amounts. They all sound so YUM! I'd probably go with spaghetti's cousin or the bento fiesta. Both are something I'd like for dinner, therefore, would be great for lunch too! I didn't realize there were menus on their website! how fun!! I would definitely try the baby spinach salad. Yum! I like the Pizza Pie! I do not have a laptop lunch box and would love to win one! I don't own a Laptop Lunch system, but I think it would be great as the kids get older for versatility! Love how you did the whole week to show different lunches. so many choices! I think I need to try WAY more than two! I'd likely try the Mexican Mango and the it's a wrap one's first! Better than a pancake would be my top choice! I would love a laptop lunch box. I got really hungry looking at those menus. Now I'm craving veggies and humus off the summer menu. I like the Bento Brunch idea! I like the Whole Grain Cakes lunch. Nothing better than breakfast all day long. bowl of cherries menu sounds delicious! There isn't a lunch menu I wouldn't want. It all looks so good. I should never look when I am hungry :) But I would like An Apple a Day and Baby Spinach Salad. We love our spinach here and my eight year old would fall head over heels for the Spanakopita. Yummmmmmm. I love that you can plan for an adult, but in a kid friendly way! I also love the portion control. Whole grains cake lunch looks great! I would love to win one. I would definitely pack a Breakfast Bento 2.0 as my son loves to eat breakfast in his lunch! I would also love the 5 minute bento as it takes no time at all to put together on a busy morning. My kids love to eat snacks and not so much an entire meal so this would not nearly be so intimidating. Thanks for the chance to win! Bento Brunch would be great for a nice change for my daughter and myself at school. I would love to win one of these just one more way of being green. Love your menus. The fruit salad bento for summertime! Fruit right now at the local famers market is so sweet and delish right now! I know my family would be fans of the Deviled Eggs and Pasta meal. I can not make deviled eggs fast enough in our house. The fruit salad bento also looks YUMMY! The fruit salad bento looks delish! These would be perfect for my twins ;) Thanks for the opportunity to win one! A Bento for your favorite tyke seems great for my young daughter. And the lunch to go is also great for those crazy mornings.